Location: Hotel “Planeta” is the newest shelter of luxury and calmness in “Sunny Beach”. The biggest Bulgarian resort has its place of first class, offering coziness and service of five stars. Situated only at 70 m from the beach in the resort’s center the hotel offers diverse recreation facilities, relax and entertainment. 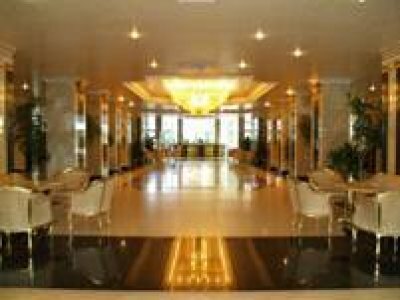 The complex is open all the year long and except the luxury furnished hotel part, it disposes of congress rooms, SPA center, fitness hall, a hairdresser’s, souvenir shop, twenty-four-hour consulting room and many entertainment possibilities. Accommodation: All rooms of Planet hotel are provided with air-conditioning, satellite TV, Internet, mini bar and wash-tub. 346 double rooms, furnished in “Empire” style offer luxury and comfort during the whole year. Especially for those who have chosen the family recreation the hotel disposes of 63 studios with a kitchen corner, a living room and two bed rooms with bath to each of them and 7 double rooms studios with kitchenette, living room and bedroom. Another option represent the 28 family apartments. Families of up to six members could be accommodated in-there as they comprise a bed room, living room with extensible furniture, two bathrooms and two terraces. There is a possibility for lodging families in other 26 family rooms with transitional door between the living room and the bed room, two bathrooms and a terrace. If you prefer the romantic privacy, the hotel offers 42 studios with a kitchenette. The main restaurant of the “Planet” hotel fascinates with its sophisticated baroque atmosphere. The fine gilding of the ornaments, the comfortable arm-chairs and the brilliance of the crystal chandeliers, combined with the perfect service, create unique atmosphere of luxury, comfort and freshness. In the open kitchen everyone can observe the preparation of the meals, and the skills of the cooks turn the casual cooking into a real show. The Hotel also offers snack’s, fish restaurant, lobby bar, SPA centre. 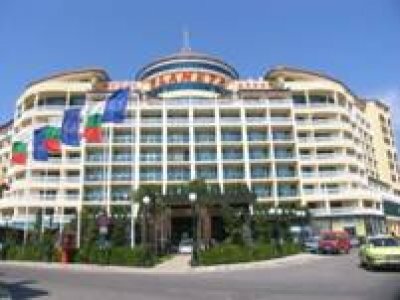 The “Planet” hotel disposes of three conference halls: “Sofia” hall - 350 places, “Bourgas” hall - 80 places, “Nessebar” hall - 60 places.